One of the most important pieces of gear essential for music production and DJing is an audio interface. 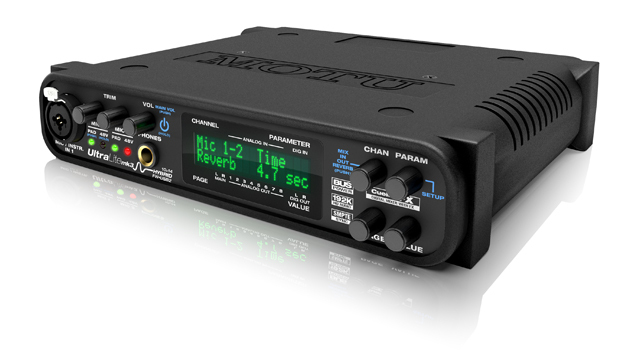 Choosing the right audio interface may seem a little overwhelming. There are many types of connection types, input and output configurations, size, formats, and many other options to consider. To help you navigate the choices, techno producer/DJ Jason Emsley weighs in with some fundamental advice on selecting the best interface for your needs. When you’re first getting started down the path of computer-based production and DJing, there are dozens upon dozens of purchases to consider such as Digital Audio Workstations (DAWs), plugins, instruments and effects, groove boxes, hardware control surfaces, studio mixers, studio monitors, and so on. Don’t worry if you’re fuzzy on some of these terms. What’s more important to understand right now is that none of the mentioned gear will transform your digitized ideas into audible sound, nor will it convert sound from the physical world and record it into your digital sketchpad. For this, you will need an audio interface. Aside from your computer, an audio interface is the most important tool underpinning a rock-solid portable studio and performance setup. With this article, our goal is to equip you with the knowledge to make an informed decision about buying a new interface. You may think, “But I already use the headphone jack coming out of my laptop’s soundcard. Isn’t that good enough for now?” In one word: No! On the surface, the reason for this is fairly simple: Soundcards that come pre-installed within consumer laptops are sufficient for general multimedia use and are not equipped handle the demands of external gear, or able produce high-quality sound. A basic soundcard will work fine for watching movies, listening to music, and playing video games. However, these devices are not manufactured to simultaneously convert multiple channels of audio in and out of your computer, all the while accurately maintaining low latency performance. Furthermore, internal soundcards do not offer the versatile connectivity you may want down the road. 1. Is portability a concern? First and foremost, as a performing artist, you will need to factor in the mobility of your setup, not just for performance, but for music production as well. Assuming that you answered yes to this question, your shopping list should automatically filter out the larger, stationary and/or studio-specific ‘rack-mountable’ audio interfaces. The ideal portable device is compact enough to fit comfortably within your gear bag and remain discreetly tucked away onstage, yet is robust enough to endure the abuse these road-ready devices tend to receive. For a frame of reference, many audio interface casings measure between the size of an iPhone and a large paperback book. 2. How many inputs and outputs will you need? Will you be recording with mics or outboard gear? The amount, type, and configuration of connections offered by an audio interface are likely the determining factors that will most influence your ultimate purchase. As you develop as an artist, your needs and wants will shift to suit your inspiration. It can be advantageous to consider an audio interface that provides a few more inputs and outputs than you may think is needed, as well as allowing for the connective flexibility that you might not use today, but possibly discover tomorrow that you want. Take into consideration what gear you already have and the gear you plan to purchase in the future. What sorts of connections do these devices have? 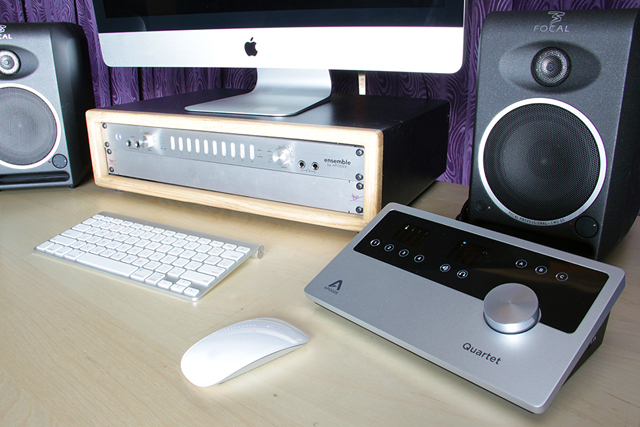 How many inputs and outputs will you need to record your instruments and outboard devices? Pro Tip: Do you have any unused audio input/outputs within your setup? 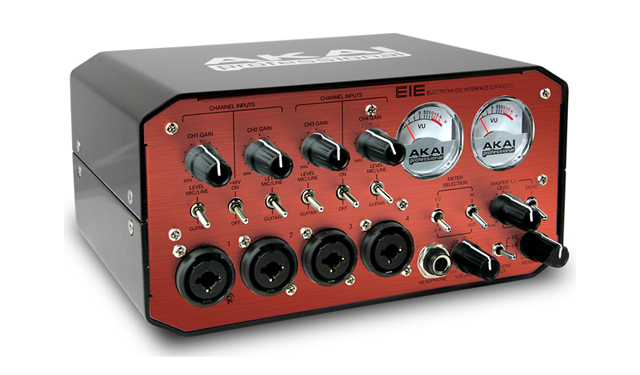 Consider incorporating an external FX unit into your workflow. With a simple configuration to your audio routing (for example with Ableton Live’s Return tracks), you can augment and further individualize your sound. 3. How will you connect an audio interface to your computer? Take a quick look at your computer’s peripheral connection ports. Are there any Universal Serial Bus (USB) ports? Do you see a Firewire port? Is there a Personal Component Interface Express (PCIe) slot? What about Thunderbolt? These are the most common connection types you will find on today’s laptops. Note that PCIe (also known as ExpressCard) is an extremely powerful option, but isn’t nearly as common as Firewire and USB, and has been dropped from Apple’s recent laptops entirely. The main point to understand here is that all of these interface ports have enough bandwidth to give you good performance while handling huge amounts of audio data in and out of your computer with minimal latency. Although there were significant differences between Firewire and USB interfaces in the days of USB 1.0, at this point any differences in performance are minimal. Pro Tip: Create a mental note of all the computer ports you will need – it would be soul destroying to finally sit down, awash with inspiration, only to discover that you have more USB devices than USB ports. External bus expansion hubs are available, but you will need to ensure that any hub has its own power adapter so that enough juice flows to your devices. 4. Does bit depth and sample rate really matter? In order to confuse you as much as possible: yes and no. In essence, what separates one audio interface from another is its ability to accurately capture the four characteristics of a sound: amplitude, frequency, phase, and dynamic range. So in an objective sense, yes, bit depth and sample rate do matter if you want to capture (and recreate) the purest, true-to-form sound possible. Honestly, who wouldn’t? Let’s be realists here – will the average person be able to hear a vast difference between an audio interface that costs $200 and one that costs $2,000? More importantly, would the difference justify the $1,800 gap spanning our two examples? For the majority of music lovers, DJs, and hobbyist musicians, the answer to both is likely to be no. You have to consider that most of the audible benefits gained via ultra-expensive audio interfaces only manifest themselves inside a well-tuned studio space and with quality monitoring equipment. Particularly where cost is concerned, bear in mind that you will eventually hit a point of diminishing returns. Your ultimate goal is to enjoy what you hear, so you have to reach a compromise where your desire for quality sound and your budget meet in the middle. To put this in perspective, if you plan to perform with Traktor or Ableton Live, ideally you will use at least CD-quality audio files (16-bit, 44.1 kHz WAV or AIFF). In truth, many if not most Traktor and Ableton Live users incorporate compressed audio in some form. If this is where you see yourself, and even if you are performing with CD-quality audio, there is no reason for you to drop extra cash on an audio interface that boasts sampling rates of 192 kHz. Bear in mind that you gain no advantage by increasing your audio card’s sample rate beyond that of your pre-recorded audio files. On the other hand, if you are traveling from studio to studio, recording heaps of analog hardware, and have a penchant for piping professional-grade vocalists through high-quality mics, it will then make more sense to invest in an interface with high-quality preamps and high-spec Analog to Digital Converters (ADC). Additionally, if you turn around and hit the stage and/or prefer to accurately reproduce what you’ve recorded, solid Digital to Analog Convertors (DAC) are another factor to keep in mind. 5. What other accessories might I need? OK! You’re nearly there. At this point, a vision of your ideal audio interface should be forming. Before you make a decision, there are still a few more things to consider. Have you thought about the kind of cables you need? Your audio interface will probably come boxed with the relevant computer connection; however it will not come with instrument cables, mic cables, MIDI cables, and so on. This is a very important (and often forgotten) consideration, as the mechanism of piping your ideas throughout your setup can represent a significant expense. Have you started to research studio monitor speakers? Studio monitors are a vital step for transmitting your ideas from your brain to your ears. Do you need a mic? An artist with a mic is a powerful force, as it opens countless doors and allows endless exploration. Not only will a mic allow you to work with vocalists, but you can also record everything from drum sets and guitar amps to pots and pans and your ambient surroundings. Does your home have thin walls? Will you mic up and record vocalists (or acoustic instruments) in the same room as your monitor speakers? If so, make sure that your audio interface has a headphone jack. Right-oh! We hope that having read this article, you are now supplied with the knowledge to go out there and augment your setup with the perfect audio interface. If you take nothing else away, try to remember this: you do not have to spend a small fortune on audio hardware to achieve fantastic results. Find the balancing point between features, quality, and price, and you will find yourself armed with hardware that will serve you for years to come. So, enough reading– go make some noise! In 1979, Jason Emsley was born in La Jolla, California; hardly a city synonymous with techno. If you had asked Jason to predict his future ten years ago, his answer most likely would have been the depiction of a man slouching inside an 8×8 cubicle; the color of his tie a sole declaration of individualism. Thankfully, while attending The University of Colorado at Boulder, Jason’s parents pushed him to follow passion rather than convention. Making his first connections with electronic music around the age of 16, the curiosity to delve further into the genre began to pull at the back of Jason’s mind. At the age of 20, curiosity became a reality with a pair of Technics and a vinyl addiction. Expanding creative interest moved Jason into production, so upon completing his degree in 2003, he moved to London for further study in audio engineering. In just two short years, Jason Emsley – or “That California Guy” as he has become known overseas – has made a serious impact within America’s resurgent techno scene. Jason’s first solo release on Cologne-based record label Platzhirsch Schallplatten, the “Function EP”, undoubtedly raised the bar for the current rising tide of young techno producers. His subsequent productions for Platzhirsch have included two more solo EPs, as well as the honor of remixing last year’s undisputed bomb, “Doppelwhipper”. His latest release, the “Inept Starlet EP”, which subtly pokes fun at America’s ‘famous-for-being-famous’ celeb-reality, has topped the charts of several top international DJs. In combination, the strength of his releases has established Mr. Emsley as one of America’s finest up-and-coming talents. Production-wise, one of the most respected facets of Jason’s work is his attention to detail. Monstrous kick drums thump alongside his signature pounding bass lines. This sub-based underpinning constructs the perfect backdrop to snappy percussion and the tracky, heady melodies that make his tracks so special. Less than a year after his first release, this perfectionism landed the young producer two trips overseas and headlined gigs at prestigious clubs such as Berlin’s Berghain/Panorama Bar, Zurich’s Kaufleuten, and London’s T-Bar. In addition, Jason has recently been invited to join, as one of only two Americans, Kompakt’s influential booking roster.